Scientific Name(s): Coffea arabica L.
Photographer(s) Appreciation: Thank you Malcolm Manners (aka mmmavocado@Flickr) for this photo; it provides yet one more reason to love Coffea arabica. The fruit of Coffea arabica, aka coffee. I think about plants a lot. I notice them as I walk outside and of course I spent half of my week during the summer photographing and writing about plants for Botany Photo of the Day. Despite this, there is only one species that I think about each and every day: Coffea arabica. I have long appreciated the beauty of roasted coffee beans, but did not realize that the fruit are so attractive. Today’s photo shows the ripening drupes of Coffea arabica. These begin dark green, then gradually ripen through yellow to light red, and finally to a deep-cherry red. At this point, they are ready for harvesting (and the reason why the drupes are often called cherries). Picking the fruit at optimum ripeness is important to the quality of the coffee. Under-ripe drupes will make the coffee bitter, while drupes that have been left past the “cherry” stage will give the final product an acrid taste. As you can see, the fruit do not all mature at the same time. 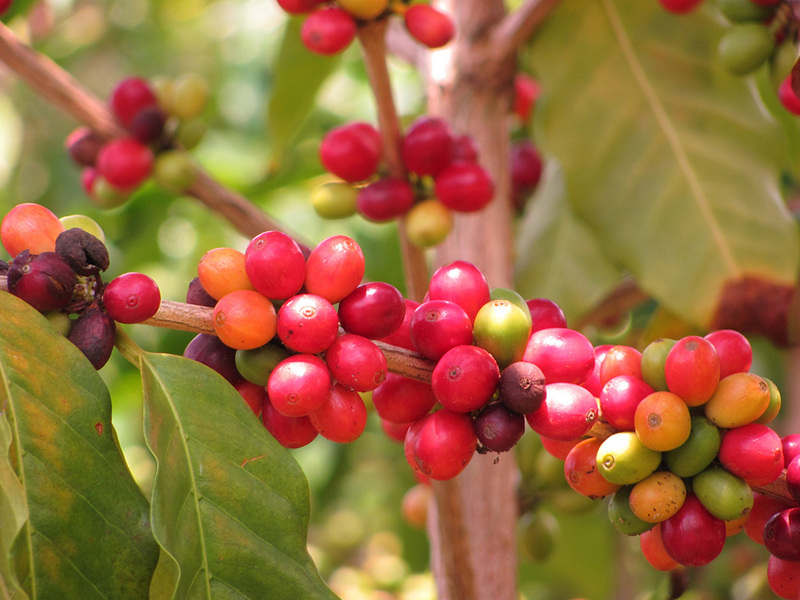 The best quality coffee comes from fruit that have been selectively harvested by hand, a laborious undertaking. Within the glowing red drupes lie two (or occasionally 1 or 3) seeds. These seeds are of course the coffee beans. They are arranged with their flat sides facing each other, wrapped in a parchment-like endocarp. Each seed has yet one more covering, the spermoderm, which in Coffea arabica is called the silver skin. The process of taking Coffea arabica fruit and transforming them into coffee beans for morning espressos is demanding. An FAO (Food and Agriculture Organization) document describes the steps involved in processing the fruit and curing the beans. Two species yield most of the world’s coffee. Coffea arabica produces about 70% of the coffee consumed. The USA National Coffee Association describes the finicky growing environment required to produce high-quality coffee from Coffea arabica, including the fact that the coffee plants must be grown at elevations ranging from 600-1800 meters in mild climates that receive about 150 cm of yearly rainfall. Such sites tend to be steep, adding to the challenge of growing this species. Coffea canephora makes up the other roughly 30% of coffee grown for world markets. It contains more caffeine and is less pleasant-tasting than Coffea arabica. On the upside, it is more disease- and parasite-resistant and can grow in warmer climates, making it cheaper to cultivate than Arabica coffee. It is often used in instant coffees and blends. A third species, Coffea liberica, is grown commercially in small amounts. Coffea arabica is a small tree with horizontal, spreading branches. Its shiny evergreen leaves are elliptical and arranged oppositely, with a length of 5-20 cm. The intensely scented-of-jasmine flowers are found in axillary clusters (they arise at the junction of the stem and leaf). Weather has a great impact on Coffea arabica reproduction. The white-petaled flowers open simultaneously 8-12 days after a triggering rainfall. Weather at the time of flowering can have a large impact on the number of fruit produced, with sunny days tending to produce more fruit than is beneficial to long-term production. A fascinating description of Coffea arabica. It has made me reflect on the origin of that morning cup of coffee. Thank you, Daniel, for that great explanation. Have you thought of compiling your Botany Photo of the Day photos and explanations into a book? Each description is so well written! Today’s author was again Tamara Bonnemaison, so I can’t take credit. A book would be difficult; too many permissions and licenses to be secured, since so much of BPotD features contributions from so far afield. I could do one solely with my own photographs, but it wouldn’t have the same depth or breadth of plant diversity — unless I find ways to increase my international travel. A couple of years ago I was walking through a jungle in Mexico, near San Blas, photographing some butterflies. There were coffee plants interspersed throughout the forest, a truly sustainable agricultural model. I sampled a few of the red berries and they were delicious, very sweet. What happened to coffea robusta? Did it get renamed canephora and I’m just waaay behind the times? Perfectly beautiful photo. What a rich range of color, plus many new things to think about as I enjoy my morning cup. Yes; same thing. C. canephora is an older name (1897, vs. 1900 for C. robusta). I love coffee, too! However, I remember seeing coffee plants (only 50-60 cm high) sparsely planted on what looked like a 45 degree slope on the Pacific side of Costa Rica, back in 1990. I also remember being told while I was there that topsoil was being washed out to sea at a huge rate, in part due to agriculture on such slopes. A quick search online gave me one figure (dating from 1987) estimating 860,000,000 tons of topsoil loss/year in Costa Rica, from a surface are of 51,000 km2. That’s 17,000 tons/km2/year. That’s fairly close to what I remember, which was about 8mm/year, or 11,500 tons/km2/yr (assuming 1.44 tons/m3). Of course, the forested land loses very little, while coffee plantations like the one I saw lose vastly more than that. Came back from that trip promising to buy only shade-grown coffee.